Mega Passport - All Attractions Once "[email protected]"
Book this ticket and only pay child prices before 31st May! Experience the craziest Park in Majorca. Make a splash at the Katlantis Splash Park! 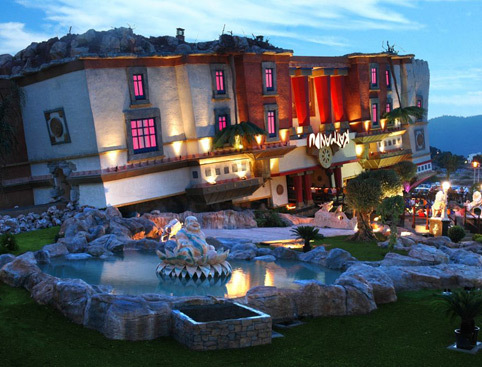 Enjoy a day at Majorca’s only theme park! Flexible ticket – can be used any day of your holiday! Includes transport from Southern Resorts. Includes unlimited drinks, plus one menu at the Snack Shak bar! Includes transport from Northern and Eastern Resorts. You will need to hand over a printed copy of your ticket when you arrive at Katmandu Park. Depending on which resort you are staying in, your pick up time will range between 8am - 9:30am. You will leave the attraction between 4pm and 5pm, which means you will get about 5½ hours inside the park. You can use this ticket on any day of your holiday! The ticket will be valid until the end of the calendar year in which you book. Once you have arrived in Majorca, please call the number supplied on your e-ticket to reserve your seats on the transport and confirm your pick-up time. Please call the number provided on your e-ticket at least 72 hours before your visit to reserve your seats on the transport. This ticket also includes unlimited drinks and ONE combi menu per person. Soft Drinks, Water, Local Beer, Red and White Wine and tea/coffee. Combi menu meal available from Snack Shack. Transport from the following Northern and Eastern resorts; Cala San Vincente, Puerto Pollensa, Alcudia, Playas De Muro, Can Picafort, Colonia Sant Jordi, Cala Santanyi, Cala Figuera, S'illot, Sa Coma, Cala Millor, Cala Bona, Costa Los Pinos, Canyamel, Font de sa Cala, Cala Ratjada, Cala Mesquida, Porto Cristo, Calas de Mallorca, Cala Domingos, Cala Murada, Porto Colom, Cala Ferrera, Cala D'or, Cala Egos, Porto Petro and Cala Barca. Please email the address provided on your e-ticket to arrange your transport at least 72hrs prior to your park visit. Print off the e-ticket and hand it over as you board the bus. A full day of unlimited access to all of Katmandu's fabulous attractions. 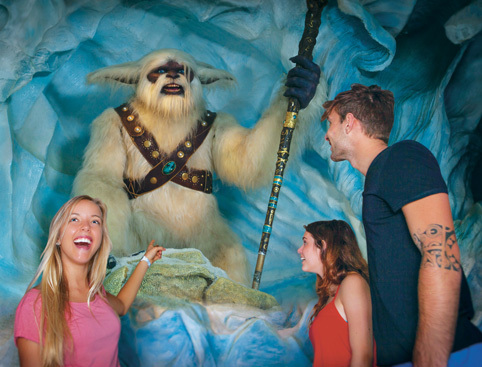 Don’t Miss: Meeting Boro, the park’s 13ft-tall yeti! Rated #2 Theme Park in Spain by TripAdvisor! Escape to a mythical world in Katmandu Park, the next-generation theme park where enchanting family fun meets pulse-racing adventure! Katmandu Magaluf is the only theme park in Majorca, and boasts the Guinness World Record’s biggest mascot – a huge 13ft tall yeti named "Boro the Great"! Katmandu Park also has restaurants, cafes, shops and loads to do - so there's everything you need for a fun-packed day. Wander through 8 awesome rooms including a Mirror Maze, Ice Cave, robot room, interactive games rooms, enchanted forest, illusions library and many more surprises. Visit the first interactive aquarium on the island – but watch out for shark attacks! Visit a musical enchanted forest which YOU control, and carve your name in the Ice Cave, before battling hurricane force winds and experiments that will make your hair stand on end! Get ready for a cinema experience with a big difference – because this one feels just like being on a thrill ride without ever leaving the room! The specially-designed seats boast up to 2Gs of force and 100 movements per second thanks to state-of–the-art technology. Truly exciting and not for the faint-hearted! Test your courage in worlds of fire and ice in this challenging game of mini golf. The €3million themed course offers 2 mega 18-hole courses for serious fun, with a fire and ice course and some awesome special effects. 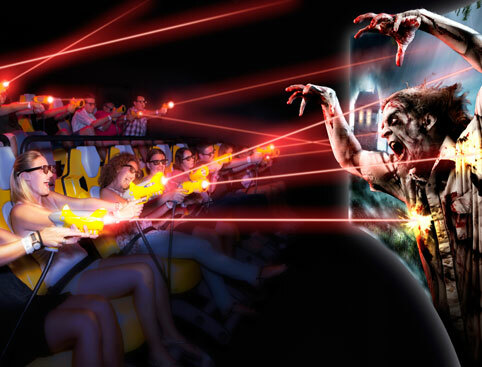 Come face-to-face with your worst nightmares at The Asylum - Katmandu Park’s attraction for the big kids! Do you dare to journey though the ruins of this abandoned mental hospital? A seriously chilling experience that will stay with you long after you’ve escaped! 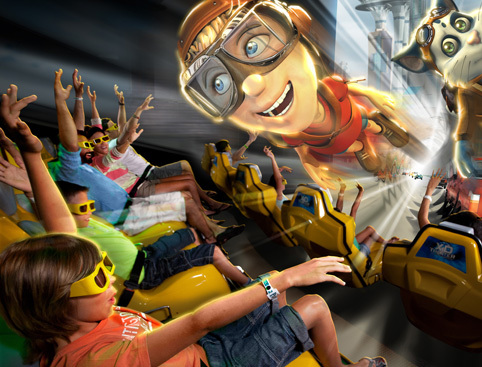 Practice your gun-slinging skills on this comical interactive motion ride experience! Chase the bad guys out of town on a Wild-West shoot out and thrilling pursuit through the desert. Two action packed adventures in one amazing experience! Battle against zombies or mutant robots the ultimate life-sized, interactive video game. Kids will love this underwater themed soft play climbing zone - one of the biggest indoor soft play areas in Spain with 5 exciting levels! Katmandu’s very own Splash Park has massive dump buckets, waterslides, canons and water jets for hours of fun – so don’t forget your swimming gear! Some attractions may not be suitable for wheelchair users. If you are visiting the Splash Park please bring suitable swimwear. Lockers are available on-site. Katmandu Park is located at Avenida Pedro Vaquer Ramis, 9 in Magalluf, next to the Sol Katmandu Park & Resort (Palma-Andratx motorway – exit 13). Some of our ticket options include return transport to the park from various resorts. Cala San Vincente, Puerto Pollensa, Alcudia, Playas De Muro, Can Picafort, Colonia Sant Jordi, Cala Santanyi, Cala Figuera, S'illot, Sa Coma, Cala Millor, Cala Bona, Costa Los Pinos, Canyamel, Font de sa Cala, Cala Ratjada, Cala Mesquida, Porto Cristo, Calas de Mallorca, Cala Domingos, Cala Murada, Porto Colom, Cala Ferrera, Cala D'or, Cala Egos, Porto Petro and Cala Barca. Please ensure you select the correct ticket for your resort. April - Wednesday and Friday. When booking the transport option tickets, please only book for a day where transport is available for that particular resort. Pick-up time: Depending on the resort you are staying in, your pick up time will be between 8am – 9.30am, and you will leave the attraction between 4pm and 5pm. Reserving your transport: Please reserve your places on the transport at least 72hrs before your park visit by emailing the address provided on your e-ticket. Katmandu Park Majorca is rated 4.8 out of 5 by 8. Rated 5 out of 5 by jeff1964 from brilliant fun day out bought tickets off same company for blackpool, so used them again for katmandu park. excellent deal, much cheaper than at resort and 5 euro voucher off per person for food and drinks. the park is excellent fun, asylum, the house and zombies were my favourite, you had to queue for an average of 10 minutes, but it was well worth it, would certainly use attractiontix again in the future. Rated 5 out of 5 by DaveNat2002 from Best priced site for katmandu tickets. I looked on the internet for about 2 hours on many sites and found this site by accident. So glad I did as this was by far the best prices. I had 3 adults and 4 children. And all had a great time. This was the 8th time at this attraction. Rated 5 out of 5 by Michelle81 from Excellent value for money I bought tickets for myself and my two children , it was an absolute bargain... it was basically an all inclusive trip with transport for a fantastic price!! Would definitely use this company again !! Rated 5 out of 5 by thatgirl from Very pleasantly surprise Bought tickets for a group of 4 and the process was very straight forward and easy. Park was easy to find and we had no issues accessing all the attractions. The House is an amazing experience, do take your time and explore the whole house before moving on the other areas. Plenty places to sit and enjoy a rest/drink or ice-cream :) With a water park and a mini golf on site you can spend the whole day here and even leave wanting more time. Rated 3 out of 5 by AshBash from Good day but not what expected Went for our sons birthday not a great deal to do. Crazy golf was great fun and the 4d was good. Extremely disappointed when we went that splash zone wasn't open as this was what my son was looking forward to, would have been nice to have been informed of this at the time of booking tickets.